ZACHARAKI STUDIOS is located in Kamari, just 50 meters from the homonym beach. It is the most famous tourist resort of Santorini. 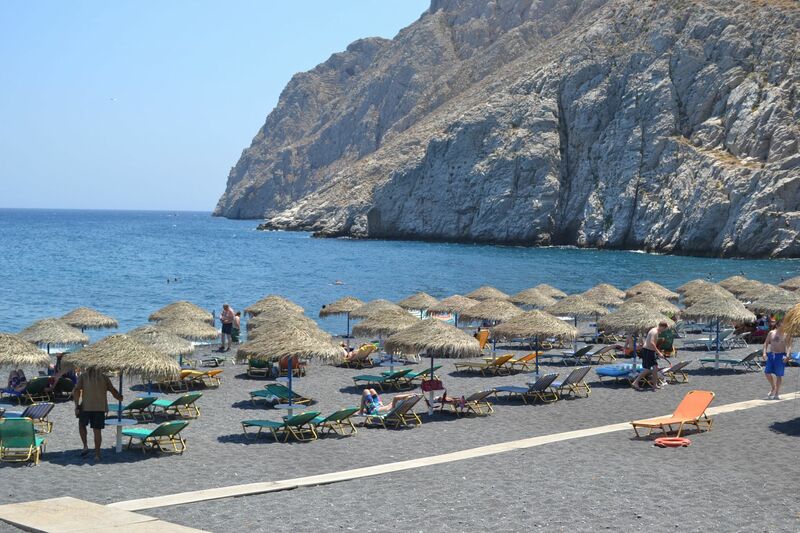 Kamari beach has become world famous due to its extensive black sandy beach and crystal clear waters. It has an unreal beauty that wins the heart of every visitor. Kamari is 10 km from Fira, the capital of the island. The city of Fira was built in the late 18th century and is considered the most beautiful Cycladic city. The famous traditional architecture with which it has been built, in combination with the special character of the island, give the settlement a unique splendor. Meet her and let yourself give in her charm! However, the stay in Kamari can be combined with the tour of Santorini and the fun as the distances are small. So you can easily visit Imerovigli with the magnificent view of the Caldera, Oia and enjoy a magnificent sunset, Perissa and Perivolos with the equally beautiful black sandy beach, the Pyrgos and the monastery of Prophet Elias located on the highest peak of Santorini , the traditional village of Megalochori and visit the volcano, the trademark of our island, with the traditional tourist boats. But also the entertainment options in the seaside settlement of Kamari satisfy all the tastes. Along the coastal road there are restaurants, taverns, cafes and bars where you will spend unforgettable evenings. Kamari beach is distinguished for its excellent tourist infrastructure. Its characteristic is the endless black sandy beach that extends up to Monolithos. Its waters are crystal clear, but deepens abruptly. That is why we recommend that you be careful. There is also a possibility for water sports. During your stay in Kamari, it is worth visiting the archaeological site of Ancient Thira. In ancient times, Kamari was the port of Thira. Excavations in the area have brought to light important archaeological finds.